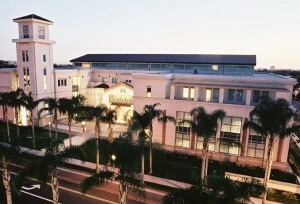 Kennedy Hall at Chapman University, home of the Fowler School of Law. ORANGE, Calif., June 17, 2015 — Chapman University’s Dale E. Fowler School of Law has placed among the top finalists in the nation in the Law School Admission Council’s (LSAC) Diversity Matters Awards. Fowler Law placed third in the competition, which recognizes law schools throughout the U.S. and Canada that have performed exceptional outreach efforts and activities targeted to students from racial and ethnic groups under-represented in the legal profession. The University of Denver’s Sturm School of Law placed first in the competition. Other Top Ten finishers included Yeshiva University’s Cardozo School of Law, Lewis and Clark Law School, Loyola University Chicago Law School, University of the Pacific’s McGeorge School of Law, Southwestern Law School, Syracuse University College of Law, University of Washington School of Law and the University of Toronto Faculty of Law. Having earned a Top Schools ranking in U.S. News and World Report, the Fowler School of Law at Chapman University emphasizes personalized traditional legal instruction, real-world skills training and professionalism. The law school is located in Orange County, California, and is known for its excellent faculty, collegial atmosphere and personalized education.